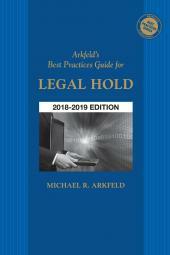 A new edition of the Best Practices Guide for Legal Hold, which provides strategic guidance, recommendations and practice forms necessary in preparing for and implementing a “legal hold.” It covers the components of a legal hold readiness plan to identify, preserve, collect, process and review electronic data for disclosure in a timely manner. Features include sample legal hold procedures and forms for an organization, preservation notice letters for clients and opposing counsel, and a section on information technology discovery questions. 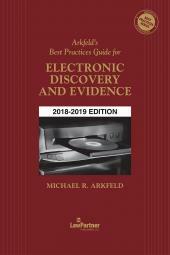 A new edition of the Best Practices Guide for Electronic Discovery and Evidence, which offers an overview and workbook for the myriad legal and technological issues that need to be addressed whether you are requesting or producing “electronically stored information” (ESI). 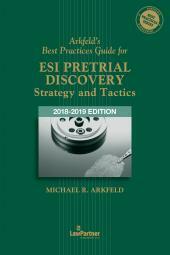 The workbook provides a plan and pretrial steps for discovering and disclosing ESI. Also included is a “meet and confer” planning guide outlining the key topics and questions for a pretrial conference. The materials previously supplied on the CD-ROM are now available on the download center. This provides fingertip access to sample discovery forms, letters, and court orders, and includes dozens of practice tips and pointers. If you need help accessing the download center, please visit https://store.lexisnexis.com/help. Visit our E-Discovery Page for additional information. Networked multi-user pricing is available for the CD-ROM. Please contact a Sales Rep at 800-223-1940 for pricing.